When a major transshipment and maritime trade company needed to enhance its floating crane communications network aboard its operational fleet, it turned to BATS to provide its industry-leading antenna tracking technology. 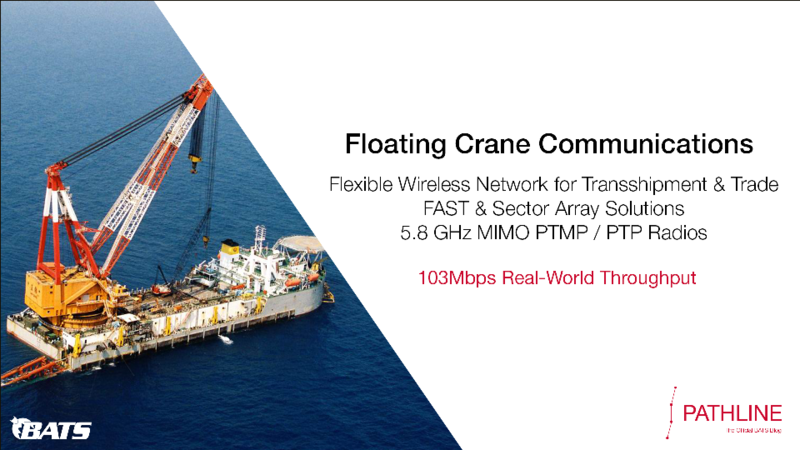 What the operator needed was a wireless communications link that would maintain the 160 square kilometer wide operational area of the floating crane, while delivering the high throughput, 100Mbps broadband link needed for video monitoring, communications, and future remote control needs of the asset. Situation With a consistent schedule of high-profile events, including the annual Rodeo and Super Bowl LI in Houston, Texas; Harris County Sheriff's Office, (HCSO), in coordination with Harris County Emergency Management and Harris County Central Technology Services recognized the need to dramatically update their communications infrastructure. Situation: Following up with the successful test deployment with the "Queen of Alberni" vessel for the Tsawwassen to Duke Point route, BC Ferries took aim at providing connectivity to a key vessel operating on the difficult Route 1. We Worked with Mimosa's B5c to Deliver Industry-Leading Gigabit Unlicensed Wireless for Communications and Data We've developed a unique solution using Mimosa's ODU B5c radio to deliver communications and data for operators needing high-speed, spectrum efficient, broadband communications and data. Deployed: High-Speed Communications & Data Network for Ferry Transit Situation: P&O Ferries in Dover, England needed to augment its existing satellite infrastructure for its vessels operating along the Dover to Calais route. Bandwidth and network availability levels for the satellite link across the servicing fleet was inadequate for the high-speed, seamless browsing experience that customers had become used to throughout their daily lives. Deployed: Innovative Solutions for Event Communications Situation: When large events arrive, public safety officials are required to provide the assistance and security needed to support the large crowds. Paramount to that effort, is their ability to coordinate and communicate effectively, no matter the environment. Connected: Ad-Hoc Wireless Networks for Public Safety Communications Situation: With recurring limitations of deployment time, technical expertise and communications system coordination complexities, previous public safety networks are typically outdated for current demands. An area like Dallas Fort. Worth has a crucial, growing need for data connectivity and mobility in its public safety network. We Worked with Aviat's ODU 600 to Deliver Resilient, High-Throughput Wireless Communications & Data Solution We're back with another unique solution using Aviat's ODU 600 radio to deliver communications and data for operators needing high-speed, highly available broadband communications and data. Connected: Delivering Broadband Data & Communications During Ferry Routes Situation: BC Ferries in Victoria, British Columbia, Canada needed to augment its legacy terrestrial wireless and satellite infrastructure for its "Queen of Alberni" vessel. Bandwidth and network availability levels across both of the vessel's fixed, omnidirectional antennas and SATCOM link were described as "barely usable." We Worked with Cambium's PTP 700 Connectorized + Integrated ODU to Deliver the Best in Broadband Communication We've developed a unique solution using Cambium's PTP 700 Connectorized + Integrated antenna to deliver communications and data for operators with existing Cambium gear. Deployed: Delivering Backhaul for Mobile Public Safety 4G LTE Networks Situation: Public safety officials are often plagued by constant communications interruptions due to overwhelmed cellular towers during major events, and disaster scenarios. These occurrences cause an immediate influx of cellular traffic that would cripple most towers in the area, leaving public safety officials without critical communications. Connected: Offshore FPSO Communications Situation: A major energy producer off the coast of Nigeria needed to augment its satellite network to provide a minimum of 44 Mbit/s, the speeds needed to transmit critical voice and data communications from its tethered FPSO to a platform located approximately 51 kilometers away.